Law started with his home town club Arbroath and moved to Rangers in March 1907. He had five seasons with Rangers scoring once in ninety-six games at Ibrox. He was a big favourite with the Rangers fans who liked his no-nonsense defensive style. He won a Scottish League Championship medal in the 1910-11 season, and also won a Glasgow Cup winners’ medal the same season. 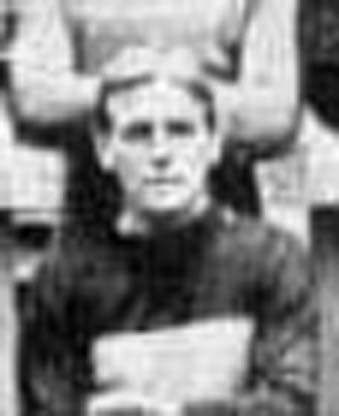 He also played for Rangers against Celtic in the abandoned Scottish Cup Final of 1909, when after a 2-2 draw the two sides were locked at 1-1 at full-time in the replay when a crowd invasion of the pitch made it impossible to continue. In his time at Ibrox, Law represented Scotland three times in 1910, when Scotland won the Home Championship with wins over Wales by 1-0 on 5th March 1910, and 2-0 over England on 2nd April 1910, both at Hampden, and a loss to Northern Ireland in Belfast on 19th March 1910 by 1-0. He moved south of the border to Second Division Leeds City when Herbert Chapman was recruiting established International players in an effort to gain promotion to the First Division in July 1912. He remained at Elland Road until August 1919, when he retired but only played in the first season of the War-time Tournaments before he returned to Scotland for the duration of the War and guested. He played for his home town club, Arbroath, once more in 1921-22. After retirement from football, he went into an engineering business with his brother.